You'll be £19.99 closer to your next £10.00 credit when you purchase Thomas Telford. What's this? Order within the next 2 hours, 14 minutes to get your order processed the next working day! Thomas Telford's life was extraordinary: born in the Lowlands of Scotland, where his father worked as a shepherd, he ended his days as the most revered engineer in the world, known punningly as “The Colossus of Roads”. He was responsible for some of the great works of the age, such as the suspension bridge across the Menai Straits and the mighty Pontcysyllte aqueduct. He built some of the best roads seen in Britain since the days of the Romans and constructed the great Caledonian Canal, designed to take ships across Scotland from coast to coast. He did as much as anyone to turn engineering into a profession and was the first President of the newly formed Institution of Civil Engineers. All this was achieved by a man who started work as a boy apprentice to a stonemason. rn He was always intensely proud of his homeland and was to be in charge of an immense programme of reconstruction for the Highlands that included building everything from roads to harbours and even designing churches. He was unquestionably one of Britain's finest engineers, able to take his place alongside giants such as Brunel. He was also a man of culture, even though he had only a rudimentary education. As a mason in his early days he had worked alongside some of the greatest architects of the day, such as William Chambers and Robert Adams, and when he was appointed County Surveyor for Shropshire early in his career, he had the opportunity to practice those skills himself, designing two imposing churches in the county and overseeing the renovation of Shrewsbury Castle. Even as a boy, he had developed a love of literature and throughout his life wrote poetry and became a close friend of the Poet Laureate, Robert Southey. He was a man of many talents, who rose to the very top of his profession but never forgot his roots: he kept his old masons' tools with him to the end of his days. rn There are few official monuments to this great man, but he has no need of them: the true monuments are the structures that he left behind that speak of a man who brought about a revolution in transport and civil engineering. Pen & Sword have republished what in my opinion is the best biography of Telford: eminently readable, as comprehensive as a single volume can realistically be, and balanced in its assessment of its subject. More illustrations have been added. 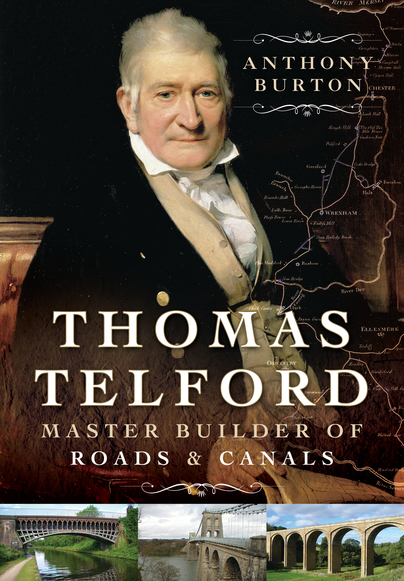 As seen in Buses magazine, this book focuses on the story fascinating story of the master builder himself, Thomas Telford. This is a must read for all with an interest in building and public road and canal uses in days gone by. Britain has its fair share of brilliant scientists and engineers, Bell, Stephenson, Wren, Watt, Brunel and the man at the core of this book by Anthony Burton. A quick trawl through the listings on Amazon reveals a number of books about Telford, some with a different slant to a more purposeful biography, and only two which attempt to examine the man in any depth, one from the nineteenth century and another from the 1950’s so the time is most definitely right for a modern reappraisal. After paying due deference to previous works the author takes us on a fascinating journey through Telford’s life. From his childhood in Scotland, to his early beginnings as a surveyor and on to the heights of a career that saw him building the first suspension bridges, in particular the Menai Bridge from the Welsh mainland to Anglesey, canals, including the great Caledonian canal and 100 of miles of roads which lead to his friend, the poet, Robert Southey comparing him with one of the ancient wonders of the world, pun intended, ‘the Colossus of Roads’. The meeting of Telford at the age of 73 with a young engineer by the name of Isambard Kingdom Brunel aged 24. A benefactor had left money in his will in order for a bridge to be built over the Avon gorge and a competition was set up to decide who would build it. Telford became the Chairman of the committee charged with making the decision, but, as you would expect he had ideas of his own design. He liked Brunel’s designs but rejected them repeatedly in favour of his own. After a public outcry Telford had to back down and Brunel built the Clifton Suspension Bridge in Bristol and began his road to fame. I bought this book in order to learn more about Thomas Telford and I’m always keen to know that the book includes all the latest research and is as up to date as possible. Without doubt, this book ticks all the boxes and I have no reservations that it will become the standard work of reference and the first port of call for anyone wishing to know about the life and career of one of Britain’s greatest engineers.